Included with the Master Thai Yoga Omnibus All Course Access: What is Thai Yoga 101 lays the foundation for understanding this amazing indigenous, traditional medicine system and exactly how it can benefit us today. The roots of Thai Yoga are found in the Ayurveda of Thailand... literally Thai Traditional Medicine (TTM). Thai Traditional Medicine is almost entirely based on Classical Indian Medicine or Ayurveda and to a lesser extant the influences of Theraveda Buddhism/ Buddhist Medicine, Traditional Chinese Medicine and the contributions of Native and Tribal peoples: Karen, Akha, Lisu, Mien, Hmung and others. This What is Thai Yoga Course 101 will give you the specifics of the history, geography, philosophy and most fundamental practice concepts. These practice idea and philosophy are adaptable and beneficial to be used as a stand alone, comprehensive system of therapy for most illnesses and disabilities. The indigenous traditional medicine of Thailand is just that for millions of people for the past thousand years... so we know the practices work as advertised! Additionally, many therapist, healers, physicians, Chiropractors, Chinese Medicine, Acupuncture Doctors, Naturopaths and Massage Therapist have found that the Traditional Thai Yoga Therapies and protocols have brought new life and healing possibilities to their existing practices. For those specializing in Chirothesia or spiritually based Hands On healing modalities these practices not only provide new and powerful clinical approaches to disease, but they reduce incidence of occupational disability that so many therapist suffer from! Traditional Thai Yoga Therapy (Indigenous Traditional Thai Massage) has for centuries been known to be as healthy and good for the therapist as for the patient, communicant/ client! As you go through the courses included here at LearnThaiYoga, please know we are available to answer your questions either in comments here or directly by email. I am a Master Teacher and Thai Aachan with 35 years of clinical practice, teaching full time since 1984. I have personally taught more than 20k students around the world do this work to date and the teachers I have certified have in their turn certified another 20k+ students to practice. We operate a 5 acre dedicated sanctuary, college, clinic and Yoga school. We know Thai Yoga Therapy, not many know it better. I can teach you to practice effectively and make a fabulous living and income with this amazing tradition. We can offer this in such a way as we do not steal or engage in cultural misappropriation. We are authentic representations of this work and the living schools which have brought it to us from ancient times. Lastly we are certainly one of the only Ayurveda, Thai Yoga and or Yoga Therapy programs administered by Physicians! If at any time you want to translate your "Certificates of Attendance and Completion" into competency based national and internationally recognized professional certifications we can do that! We offer "Live" practitioner certification courses at The Thai Yoga Center six times a year. In addition to the five competency based Thai Yoga, Ayurveda and Yoga Therapy certificate programs our college, The SomaVeda College of Natural Medicine (SCNM) offer five different College Degree Paths from Associate to Doctorate and PhD! Lastly, this program is the only US based program of it's kind which can offer you a legal basis to practice Ayurveda, Thai Yoga and or Yoga Therapy anywhere in the US. That's right, our graduates who follow our legal guidelines and NAIC Authorizations program can practice in all 50 states with no additional governmental licensing! We will be giving you all the explicit details in further courses all for your nominal monthly fee! I look forward to working with you whether you are in the on-line platform or in our Live in-class certification programs. Anthony B. James was the first Westerners ever recognized in Thailand as an authentic Thai Traditional Medicine teacher and Aachan or professor, where his work is known and honored throughout the country by the Royal Thai Gov’t Ministries of Thai Traditional Medicine, Thai Department of Commerce and Tourism Authority of Thailand (TOT- Friend of Thailand Awardee recipient), Wat Po Association of Thai Traditional Medical Schools registered AACHARN / Professor of Thai Traditional Medicine. He is a teacher of Thai Ayurveda, Classical Indian Ayurveda, Yoga and Vedic astrology (Thai Korosot Astrology), who shows how Yoga and Vedic systems of knowledge interface for optimizing our human potential. AAPNA Advisory Board Member and Registered Ayurvedic Doctor R.A.D. (AAPNA) practicing Ayurveda Medicine and therapy for over 35 years. His many books include “Ayurveda of Thailand- The AAPNA Veda Vyasa Award Recipient for 2017”, “Ayurveda and Thai Yoga, Religious Therapeutics Theory and Practice”, as well as several Telly Award winning Video Documentaries on Thai Traditional Medicine and Thai Yoga Therapy. He is currently the director of the NAIC: SomaVeda College of Natural Medicine, SCNM School of Ayurveda Medicine and Thai Yoga Center, Staff and Faculty for Oriental Medicine Doctoral program of the PanAmerican School of Natural Medicine- Nevis West Indies, and on the editorial board for the magazine International Journal of Complimentary and Alternative Medicine. Dr. James has a thirty five year background in natural healing, including the systems of Native American Medicine, Thai Ayurveda, Classical Indian Ayurveda, Chinese Medicine, Western Herbalism and Vedic Astrology. He has an MD(AM) degree as well as Board Certified Naturopathic Degree, two doctoral degrees in Natural Medicine, an OMD (Acupuncture) as well as doctorates/ PhD in Indigenous Medicine and Monastic Medicine. Dr. James also holds a Masters in Clinical Herbology and has taught herbal medicine for several years. Currently he is dean of the SCNM: SomaVeda College of Natural Medicine, School of Ayurveda Medicine and the Thai Yoga Center schools and programs. Dr. James is the author of numerous books, articles and hundreds of educational video’s focused on Ayurveda and related topics. He has presented seminars and at national and international medical conferences including AAPNA for many years. In addition to his interest and research into his family Native American Religious and medicine heritage Dr. James is an ordained priest and Monsignor of the the Sacred Medical Order of The Church of Hope (SMOCH/ SMOKH).The Church of Hope is a Church of special and sacred ministry of monastic medicine, sanctified healing, ecclesiastical medicine, holistic medicine, as well as indigenous medicines as part of religious doctrine, where he is working to integrate Ayurveda and Complimentary Medicine into the Monastic Medical Tradition of the church. November 30th. 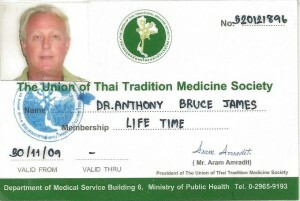 2009, Aachan, Dr. Anthony James receives LifeTime Membership Recognition with Union of Thai Traditional Medicine Society (UTTS). The award itself was presented by the Mr. Aram Amaradit (Dr. Amratisha), Member Parliament of Surin Province, Chairman of the Committee on Public Health, President and original founder: The Union of Thai Traditional Medicine Society, Ministry on Public Health, Thailand. The credentials were issued in the offices of the The Union of Thai Traditional Medicine Society, Ministry of Public Health, Nonthaburii, Thailand. UTTS Life Time recognition (Thai Traditional Medicine/ Thai Traditional Massage) credentials #520121896. What is Thai Yoga and or Traditional Thai Massage? Lecture #6: Where can one learn Thai Yoga in a live program?